Marketing Materials For A Urology Practice. Finally. Sometimes, reality sets recommended procedures on its ears. The urology practice of Drs. Uppuluri, Patel and Chavin has been successful and well-recommended for many years, yet they didn’t have a logo, a slogan, a website or even a name, generally the first things a business is tasked with creating. For a long time, that worked. Now, it was changing. Recommended to us by a local hospital’s Medical Staff Development Director, Dr. Chavin laid out the problem. Prospective patients, he knew, are now doing more and more research on the web before scheduling any procedures, making any appointments, or even choosing a physician. Even when a primary care doctor recommends a specialist, patients are checking them out thoroughly before making a phone call. Patients want to see their doctors’ faces before meeting them. They want to read CVs. They want to know that the physician they are selecting really knows his or her stuff – and they want to feel a bond before they ever shake hands. Dr. Chavin knew that, even considering the practice’s stellar reputation, in this fast-changing digital world, they had to get out there – and fast. As there were no existing marketing materials, we asked alot of questions about the philosophy of the practice, the style of the physicians, their specialities, their reputations, their attitudes about patient care and their goals for their patients – and for the practice. We read through CVs. We investigated online reviews of each doctor. We talked about preferences in colors, styles and themes. 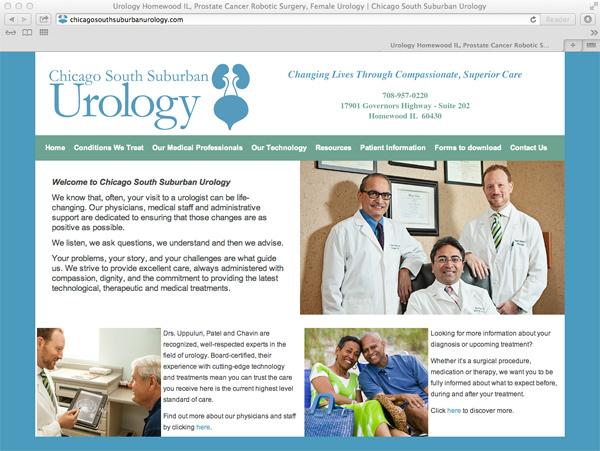 The doctors selected the name Chicago South Suburban Urology and we went to town. First, we designed and presented a variety of logo directions, then began to refine, redesign and then arrived at the logo you see above, a stylized illustration of exactly what concerns a urologist. Simple and clear, in a clean blue that can be used digitally, in print, on lab coats and office uniforms and on promotional products. We also wrote their slogan, which truly exemplifies CSSU’s philosophy. We designed and wrote the website; again simple, clear and very easy to navigate. It’s chock-full of information already, with more to come as we continue. We researched and investigated all things urology to write the copy, with the doctors giving us input and edits as necessary. Now, a web search helps locate the entire practice quickly. Patients can use the website as a resource for all their urological challenges and they can become better acquainted with all medical professionals right online. CSSU is a perfect example of how a successful business needs to continuously evolve to stay successful. Together, we took a well-regarded but very traditional practice and brought it into modern times.